Uglyworld #69 - Jeero Doesn't Want His Racking Work To Be Disturbed, originally uploaded by www.bazpics.com. After Jeero and Wage had racked up the balls to have a game Wage wandered off to the top of the table to put some chalk on his cue and wondered where Jeero had got to. 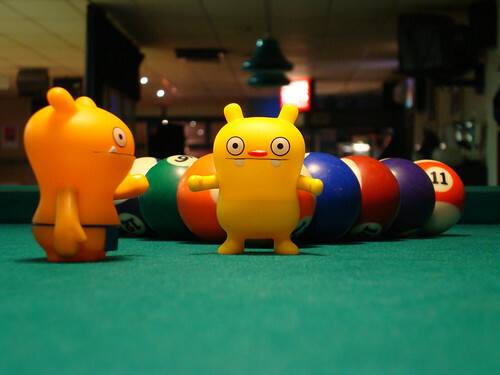 He turned round and could see Jeero standing in front of the racked balls with his hands up saying "nooooo". Wage wandered back down to him and asked politely what he thought he was up to - Jeero told him "we just made this, and now we're going to destroy it?" Wage was able to convince him that it was ok and the game kicked off. Wage won after Jeero accidentally dropped the black while going for a 3 ball plant on the 4 ball.